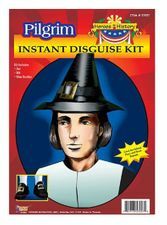 Available Sizes/Colors: Size "Teen (16-18)"
Look like one of the first colonists in this teen/tween size pilgrim man costume! Includes poly poplin black shirt with white collar and cuffs, black pants, and belt. Hat, stockings and shoes not included.